Just in 10 years after Satoshi has released the bitcoin whitepaper, crypto space has developed in a diverse ecosystem. Most of the value is now captured in payment cryptocurrencies (70% of total mcap) and smart contract protocols (23% of total mcap). Numerous appcoins account for less than 4% of total value. Bitcoin is hard money. Bitcoin is considered by many as the most prominent crypto asset getting serious institutional backers (e.g. ICE/Bakkt, Fidelity Investments, Citibank). Its dominance is stable above 50% of total crypto mcap with $700m daily USD value transferred and $200m trading volume on major spot exchanges and ~$200m in bitcoin futures (CME). The mining hashrate was rising steadily securing the cost of 51% attack over $400k/hour. The sentiment is shifting from the bitcoin as payment towards censorship-resistant digital gold and uncorrelated financial assets. Many investors view bitcoin as a hedge for a global financial meltdown. Ethereum remains the #1 ecosystem for Dapps and digital assets creation: 90% of ICOs are launched as ERC-20 tokens, >1.2M collectibles are issued as non-fungible ERC-721 tokens. There are >800 Dapps running on Ethereum processing ~10k ETH value/day. The biggest asset though is the developers’ ecosystem with 3'300 attendees of Devcon4 alone. The ICO market is cooling down. Total ICO funding has reached $19bln(comparable sizing to IPOs and PE/VC). The amount of the speculative capital in the space has decreased significantly with the crypto markets bubble burst: in September total $290m was raised by 90 ICOs, which is the lowest amount in 2018. The ratio of ICO projects reaching soft cap also dropped to an all-time low of 20%. Tokens secondary market in 2018 has been depressive. 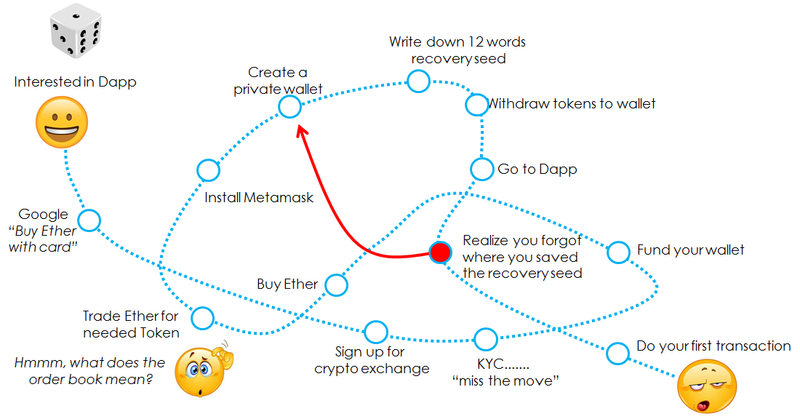 Many of the Tier-1 tokens have lost 80–90% of their value year-to-date largely due to the reevaluation of end-user utility and the speed of adoption of the technology. DApp usage remains low: total DAU of all dapps remains ~10k. Horizontal scaling. Ethereum is getting ready for a Constantinopol hard fork delayed from October to January 2019, which will set the ground for Casper Proof-of-Stake. Challengers are close to the gate: Hedera blockchain has reported scalability up to up to 200k tps on 64 nodes. Zilliqa is now being run on testnet with 1000 nodes at peak 2.5k tps. RChain has just launched the testnet in September, claiming scalability up to 100k tps. Avalanche, Algorand, BlockDAG are some of the other new promising consensus mechanisms. As protocols gain traction we may expect the migration of DApps to faster & more efficient protocols (especially EVM compatible). Vertical scaling. Bitcoin’s Lightning network is doubling every 3–4 months though still remains humble: 4k nodes, 11.9k channels, 111 BTC ($715k) network capacity. So-called lapps (Lightning apps) will supposedly be a growing area in payments space. Criticism though remains about the low permeability (<$20 can be effectively transferred) and poor economic model of the hubs. Red ocean in the exchange space. With bigger institutions entering the space we can expect more concentration of liquidity and hard competition between exchanges. Many venues will go out of business, others will be looking for margin, serving the “shadow” sector, etc. There will likely be more mergers and acquisitions coming. Tether may crash due to AML concerns. The collapse has already begun in September with USDT decoupling from $1 by 15% and more. Deltec, the new bank in Panama holding Tether’s $1.8bln reserve, is under investigation for $1.2b money laundering case, so the problems are far from over. New stablecoins are in the race to take over the king’s crown. Most prominent are TrueUSD ($158m), PAX ($136m), Circle USD Coin ($135m), MarkerDAO’s DAI ($70m). Security tokens trading. Several venues are in a position to reach the licensing deal with the regulators to trade security tokens. The runners are Circle Poloniex, Coinbase, Bittrex, tZero, Malta Stock Exchange and some others. Lykke is on track on it’s OTF application in Switzerland and has recently concluded a partnership with Nxchange, EU-based MTF and broker. NFT/Collectibles issuance boom. Crypto collectibles already account for more than 1.2 mln items. ERC-721 standard pioneered by Cryptokitties will be used to tokenize digital goods and licenses (music, digital art, etc.) with the copyright protection being solved. Specialized marketplaces (e.g. OpenSea, Rare Bits) will rival. Lykke Research Hub is an attractor for research related to crypto markets and blockchain tech and playground for Lykke to experiment with new products, financial instruments, and UX. We welcome academia and industry practitioners to submit research proposals. Best proposals will be funded. More details on Lykke Streams. In a move for new transparency standard, we have started to publish our daily trade log with resolution to account ID. To stay up to date please follow Lykke Research Hub twitter.